The light bulb that is synonymous with Thomas Edison has reached the end of its hey day. After over 130 years, the light bulb whose design has virtually remained unchanged, will slowly no longer be imported or produced here in the United States. Starting on January 2, 2012, the 100W incandescent bulb will be the first to no longer be produced. The 75W bulb will stop being produced in 2013 and the 60W and 40W bulbs will follow in 2014. The incandescent bulbs are being replaced by compact fluorescent bulbs. Thomas Edison was not actually the inventor of the light bulb. 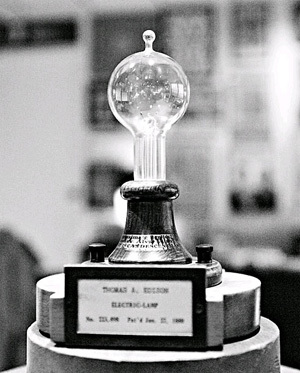 Edison built on the 75 years of work by other inventors and made major improvements on the bulb. He worked on over 3,000 different theories and materials for the building an efficient lamp. His basic idea consisted of a filament inside a glass bulb. A glass blowing shed at his laboratory provided him with the bulbs for this experiments. On October 22, 1879, Edison tested his first successful, commercially practical light. The first bulb only lasted 13 hours. On November 4, 1879, Edison applied for a patent for his newly improved invention. He received US Patent 223, 898 on January 27, 1880 for an Electric-Lamp. Experiments with the light bulb continued. Carbon filament in an oxygen-free bulb glowed as Edison as hoped but it burnt up after 40 hours. In order to make a bulb that would last much longer, Edison began testing carbonized filaments made from every plant he could find. He had fibers sent from tropical plants too. Eventually, in late 1880, it was the memory of a bamboo pole used on a fishing trip in Wyoming that led to finding the perfect filament. Carbonized bamboo filaments were burning in light bulbs for up to 600 hours. In 1890, the first plant to manufacturer incandescent light bulbs was opened in Menlo Park, New Jersey. 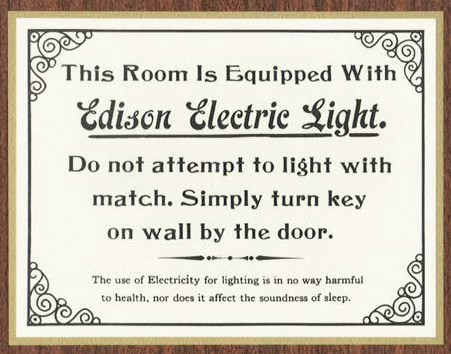 The success of the Edison style light bulb has been tremendous. Now, though this era has ended as Americans will slowly no longer be able to purchase the lightbulb that has looked almost the same since 1880.